PREAMBLE: As the 1996 inventor of the Apollo Dust Detector Experiment. my attention was drawn to the NASA National Space Science Data Center (NSSDC) Website of the detector in October, 2006, to read that the site stated (as it did until 14 September, 2018 when the server was ended, that “Measurements were made over the course of each lunar day, returned to Earth, and stored on magnetic tape. Selected data were plotted. The original tapes were subsequently misplaced before they could be archived, the only existing data from these experiments are on the plots (Bates and Fang, 2001”. We sent an e-mail to the Website gate keeper in October 2006 advising that we had about 100 such tapes and much data in Perth. Since then, my communications about errors in these NSSDC websites for Apollo 11 dust detectors have continued. Here we show direct evidence of two different types of disinformation. One type was continuation of misinformation that the design was "expanded". The other type, introduced in 2013, is a change in the name of the Principal Investigator. Both errors continued until the NSSDCA server was pulled down about 14 September 2018. Relevant quotes of relevant and dates of 4 NSSDCA websites 2006 to 2015 follow. We add emphasis in red to assist focus on these issues. QUOTE 14 June, 2013 : The Dust Detector was originally designed to measure only dust accumulation but was expanded to include the particle, radiation, and temperature studies when it was determined from Surveyor engine findings on the surface that the dust accumulation would not be as heavy as anticipated. (The original dust accumulation design was flown on the Apollo 12 mission.) The expanded experiments were flown on the Apollo 11, 14 and 15 missions. SOURCE: NSSDC Apollo 11 site. Version 4.0.24, 14 June 2013. Ironically, the actual digital measurements of the temperature change could be valuable, showing a distinct effect. Of our 14 peer-reviewed publications on dust and related issues, 12 relied mainly on the original orthogonal orientations of Apollo 12 alone. Reference (and deletion of reference) to Surveyors is very important because it reveals (or conceals) with mention (or no mention) of Surveyors, the provenance and thus credibility of the reasons for modifications by NASA MSC of O'Brien's original invention can be tested. 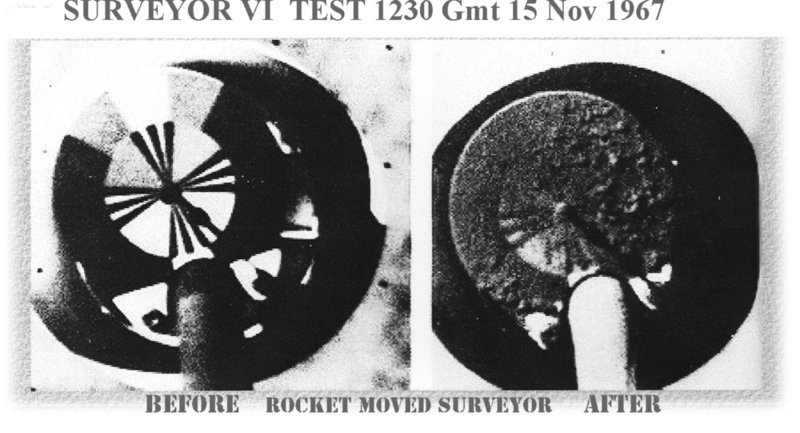 With mention of Surveyor, a reasonable person can then find that the 1967 Annual Report of the Jet Propulsion Laboratory (JPL) (Page 7 shows) before-and-after photos by Surveyor 6 of the extensive dust resulting from a minor hop of 2 to 3 metres by the small vernier rockets lifting the relatively lightweight Surveyor 6. Accurate scaling of Surveyor findings to the Apollo 11 rocket exhausts at LM ascent appears beyond present skills. However the qualitative dense dust effects with Surveyor are indisputable, clearly proving that the statement and rationale in the NSSDCA website are incorrect and false. Such information was in the public domain more than a year before the decision to modify the Dust Detector Experiments was made. Collateral damage from faulty interpretations by MSC and Bellcomm of Surveyor measurements before Apollo 11 was vastly damaging to the effectiveness of all Apollo dust research. First it led to modification without consultation of 3 of 4 DDEs, so that only Apollo 12 has my original orthogonal array of solar cells, while Apollo 11, 14 and 15 solar cells are all horizontal. Consequently, several major discoveries with Apollo 12 DDE vertical solar cell facing East (Sunrise) are solitary examples, and thus necessarily we must treat them as somewhat uncertain. Second, MSC and Bellcomm confusion spread into major NASA reports on Apollo, such as "Apollo Scientific Experiments Data Handbook (NASA TM X-58131, August 1974). The NASA Handbook entirely omits Apollo 12 DDE, by far the most powerful and fruitful DDE, starring in 12 of 14 published discoveries. Third, incorrect phrases about Surveyor on page 25-3 are now quoted (without a reference) in the Apollo 11, 12, 14 and 15 lunar dust websites of the distinguished Lunar and Planetary Institute in Houston, corrupting them to carry on and spread the 1964-69 dismissal mindset into the 2019 cultures of the LPI staff. (For readers, the incorrect page 25-3 phrase of the Handbook borrowed by LPI websites for Apollo 11, 12, 14 and 15 websites on lunar dust detectors was " subsequent engine firings of the Surveyor spacecraft on the lunar surface showed the dust layer and resultant blowing of dust to be much less than expected." The LPI websites state" The dust accumulation proved to be much lower than expected..." not only for Apollo 11, but for Apollo 12, 14 and 15 websites. In reality each of the 4 DDEs measured different dust effects (see Table 2 from O’Brien, B.J., 2011, “Review of measurements of dust movements on the Moon during Apollo”, Planetary and Space Science, 59, pp. 1708-1726, doi: 10.1016/j.pss.2011.04.016).